On April 11, 1899, Coburn Haskell, an avid golfer, and Bertram G. Work, an employee of the B.F. Goodrich Company in Akron, Ohio, received a patent for a golf ball. Initially, golf balls had consisted of leather pouches stuffed with boiled feathers. In 1848, a new golf ball — the gutta-percha — began to replace the “feathery,” as the original golf ball was known. The gutta-percha consisted of hardened juice from trees located in South America and the Pacific Islands. Unfortunately, the gutta-percha proved difficult for golfers to hit out of both fairways and the rough. They were, however, much cheaper to manufacture than the feathery. Haskell’s and Work’s ball consisted of rubber thread wrapped around a solid rubber core. This golf ball was much easier for golfers to hit and also allowed players greater control when they hit the ball. 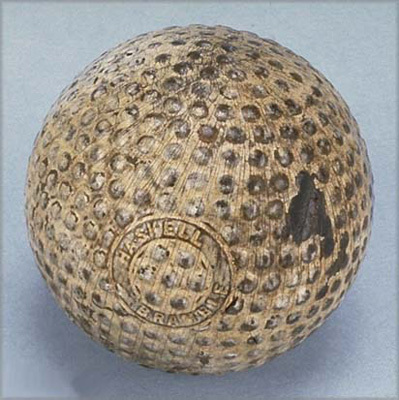 As a result of the Haskell and Work golf ball, the game of golf dramatically increased in popularity within the United States. In 1901, Haskell established the Haskell Golf Ball Company. This company manufactured Haskell’s and Work’s new golf ball. It was the only company legally permitted to do so in the world during the first decades of the 1900s, making Haskell a very wealthy man. In 1917, he sold the Haskell Golf Ball Company and his patent. The Haskell Golf Ball Company ceased operation this same year. 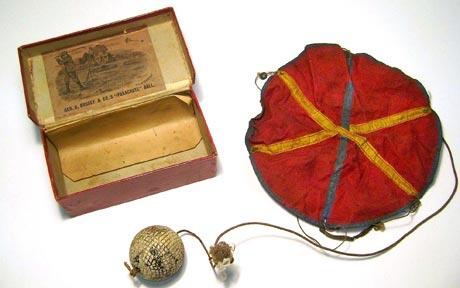 A 19th century golf ball attached to a small parachute has shown that participants of the sport have always used gadgets to improve their game. The device called “A.J.B. Halley’s Captive Golf Ball” dates from the 1890s and has turned up for sale at auction. These items are incredibly rare because usually they broke and were thrown out, but this little-used example is complete with parachute and box. The object was to drive the ball and allow the red parachute to slow it down then help it descend closer to the golfer. The person hitting the ball would then not have to walk far to retrieve it. 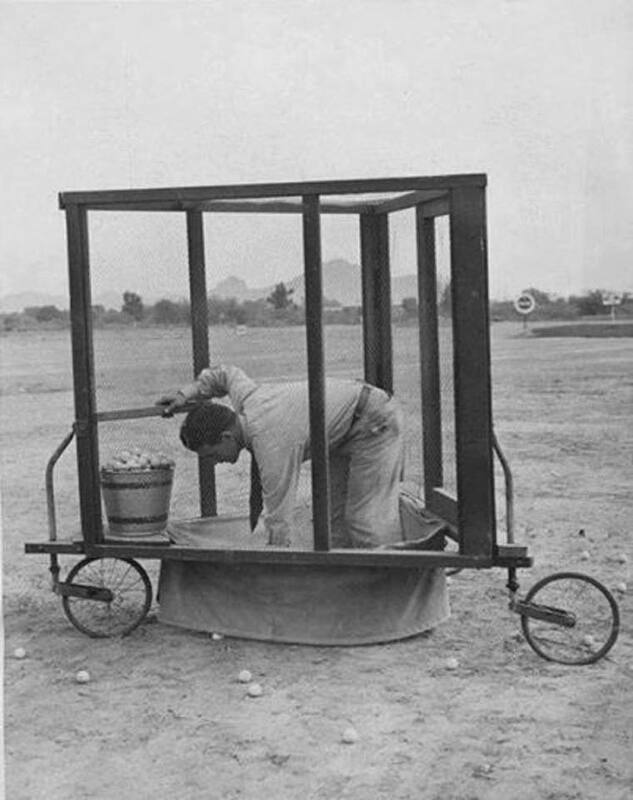 It was not particularly successful and the creation of driving ranges meant it was never likely to catch on. The device includes a golf ball made from gutta-percha, which is a type of India rubber, which has a cord through it. The cord is about ten inches long and attached at the other end to a red canvass parachute just a few inches across. The golf gadget industry today is worth billions of pounds a year and this example shows that the industry is well over 100 years old. It is expected to fetch up to 150 pounds when it goes under the hammer at Bonhams in Chester on February 24. “These are rare items because usually they would be broken,” said Caroline Morrell, golf administrator at Bonhams. “They were not held with great value or regard so it is unusual for one top have survives intact complete with its box. She added: “I think in the end golfers came to the conclusion that it was too difficult to hit a ball which had a cord attached to it. “And it was probably difficult to use if there was a strong wind blowing. 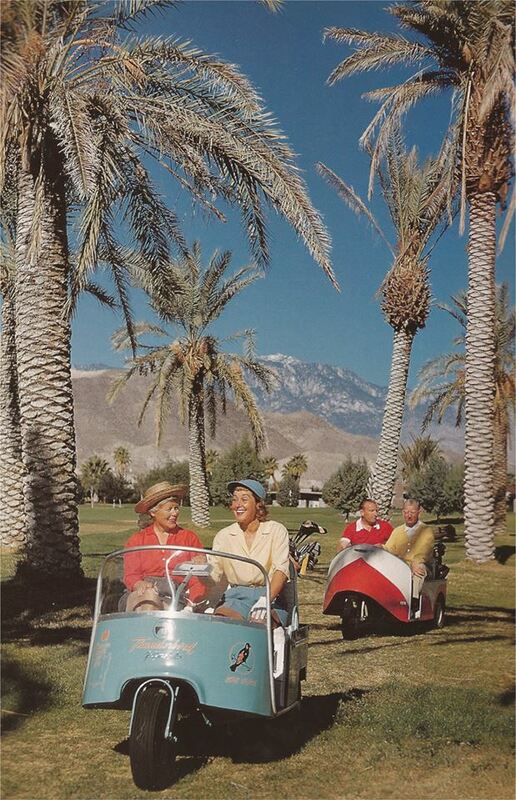 The advent of driving ranges made things like this unnecessary. In the earliest days of golf on the eastern coast of Scotland, players used primitive equipment to play the game in a rather haphazard and casual manner. 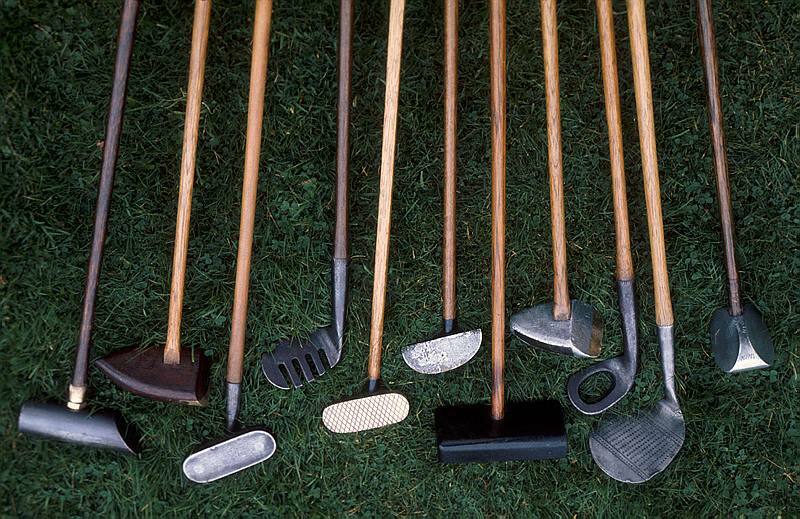 The first clubs and balls specifically made for golf were fashioned from wood. One documented reference is that of a John Daly playing with a wooden ball in 1550. In 1618 the feather golf ball or ‘Featherie’ was introduced. This was a handcrafted ball made with goose feathers tightly packed into a horse or cow hide sphere. The feathers and leather were fashioned into a ball while wet. As the assembly dried out the leather shrank and the feathers expanded to create a hardened ball. The ball was then finished off by painting it and punched with the ball-makers mark. Quality varied according to the skill of the craftsman. Unfortunately, the handcrafted nature of the balls meant that they were priced beyond the pockets of the masses, sometimes more expensive than a club. Notable ball-makers of the 1600s were Andrew Dickson, Leith and Henry Mills, St Andrews. 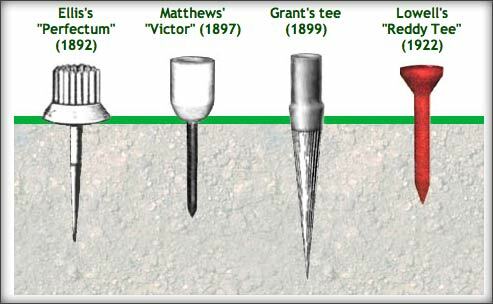 The introduction of the Gutta Percha ball or ‘Guttie’ in 1848 by Rev Adam Paterson of St. Andrews and the spread of the railways directly contributed to the expansion of golf. The Guttie ball was made from the rubber like sap of the Gutta tree found in the tropics. When heated the rubber could easily be fashioned into a sphere and used as a golf ball. Not only could the ball be relatively cheaply produced, it could also be easily repaired by re-heating and then re-shaping. Initially Gutties had a smooth surface which meant that they didn’t travel as far as the Featheries. The balls were usually stamped with the ball makers stamp, most notably Allan Robertson. After 1880, gutties were produced with patterns on their surface in an attempt to reproduce the distance characteristics of a scored Featherie. With the Victorians came industrialisation and mechanisation, and by 1890 Gutties were being made in moulds which further increased their affordability, consistency and quality. The most notable pattern of the period was the ‘Bramble’ – raised spherical bumps across the surface of the ball. Many of the rubber companies including Dunlop began mass-producing balls which killed off the handcrafted ball business. In 1898, Coburn Haskell introduced the one-piece rubber cored ball which was universally adopted by 1901 after it proved so effective in the British and US Opens. These balls looked just like Gutties but gave the average golfer an extra 20 yards from the tee. These balls were constructed from a solid rubber core wrapped in rubber thread encased in a gutta percha sphere. Once W. Millison developed a thread winding machine, Haskell balls were mass-produced and therefore more affordable. Throughout this period there was a lot of experimentation with the patterns on golf balls – one of the reasons why golf collecting is so interesting. When William Taylor first applied the dimple pattern to a Haskell ball in 1905, golf balls took on their modern form. The dimple pattern maximises lift while minimising drag. Manufacturers continued to experiment with golf ball design including Goodrich who introduced the pneumatic ball in 1906 (the patent was held by T. Saunders and filed in 1901). Quite simply this was a Haskell ball with a compressed air core which unfortunately was prone to expansion with heat and therefore causing the ball to explode. Others tried mercury, cork and metal cores. Only in 1972, when Spalding introduced the first two piece ball, the Executive, was the basic Haskell design improved upon. In 1921, the R&A and USGA standardised the size and weight of the ball. Since then further constraints have been proposed which are detailed in the rules. Between 1931 and 1990, both organisations differed on the dimensions of the golf ball which meant that the game played on either side of the Atlantic was similar but different. Today there is a rich variety of golf balls to suit the individual game and circumstance. Some offer control, some offer distance while others are suitable for practice only. Antique golf balls are avidly collected and are becoming increasingly valuable. A dimple patterned Guttie in good condition is worth about $US 500.